The Pennsylvania GOP sent out a press release promoting its upcoming Lincoln Day Dinner on February 1 in Hershey, PA, which will be headlined by Sen. Pat Toomey. “We are proud to have Sen. Toomey keynote our 2019 Lincoln Day Dinner as we look to energize our Party for an exciting year and begin implementing strategies that will make Republicans successful across the commonwealth,” PA GOP Communications Director Jason Gottesman said. The previous GOP dinner in the fall was headlined by Donald Trump Jr., who stressed the need for Republican candidates to embrace the Trump agenda prior to the midterms. The general reception and VIP reception begin at 6 PM. The dinner will start at 7 PM. General admission per person is $150, while it’s $400 per person for a VIP ticket. General admission for state committee members is $75. To be a “Gold Sponsor” for a table of 10 VIP reception and dinner tickets costs $10,000. A “Silver Sponsor” table that includes 4 VIP reception tickets and 6 general reception tickets costs $5,000. A “Bronze Sponsor” table that includes 4 VIP reception and dinner tickets costs $2,500. Those interested can RSVP here. The Pennsylvania Democratic Party did not immediately respond for comment on this event. The Republican Party just keeps shooting themselves in the foot. DiGiorgio is running this party into the ground. People should attend just to see the circus that is going to unfold during the endorsement process. The Republican party is divided more than ever and DiGiorgio is on his way out. It’s just one bad decision after anonther…..
Snoring might interrupt his boring…speech. But I would go to hear him resign. A partisan, never a statesman. 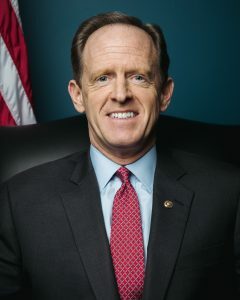 Is Toomey going to announce the GOP plans to bring back slavery?